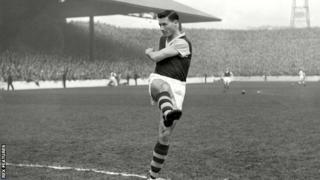 Jimmy McIlroy scored 10 goals in 55 caps for Northern IrelandFormer Burnley and Northern Ireland forward Jimmy McIlroy has died at the age of 86.McIlroy played 497 games for the Clarets between 1950 and 1962, winning the old First Division title in 1960.He made 55 appearances for his country, scoring 10 goals between 1951 and 1965, and helped them reach the World Cup quarter-finals in 1958. Burnley said they were "deeply saddened to learn of the death of our greatest ever player".A club statement added: "A giant of a man. The thoughts of everyone connected with the club are with his family and friends at this sad time. "McIlroy started his career at Northern Irish club Glentoran in 1949 before moving to England with Burnley one year later. He went on to score 131 goals during a time the club describe as their "golden age".Having won the league the year before, the Clarets reached the quarter-finals of the European Cup in 1961, losing 5-4 on aggregate to Hamburg, and in the following season they finished as league and FA Cup runners-up.After leaving Burnley in 1962, McIlroy made 116 league appearances for Stoke before moving to Oldham and retiring from playing in 1967.He was appointed Oldham manager in 1965 but left in 1968, and also took charge of Bolton for a brief period in 1970.At the World Cup in 1958, McIlroy and his Northern Ireland team-mates, captained by Tottenham great Danny Blanchflower, were beaten 4-0 by France in the last eight.An Irish Football Association statement read: "The association is saddened to hear of the death of Jimmy McIlroy, one of Northern Ireland's greatest ever players. He was one of the heroes of the 1958 squad. "Burnley's Turf Moor stadium has a stand named after McIlroy and he was given a testimonial by the club in 2009.In 2011, he was made an MBE for services to football and to charity, deciding to receive the honour at Turf Moor instead of travelling to Buckingham Palace.In the years following his retirement from football, he worked as a writer for local newspaper the Burnley Express. "Again I rang my wife and said there's good money here etc and she just said: 'Sure, but what would we want to leave Burnley for? '"I've never regretted it. From the moment I arrived it felt like home and it has been home."